Heat oven to 375ºF. Grease bottom and side of 9-inch springform pan or 9-inch square pan with shortening or cooking spray. In small bowl, mix 1/2 cup granulated sugar, 1/3 cup flour and the cinnamon. Cut in butter, using pastry blender (or pulling 2 table knives through ingredients in opposite directions), until crumbly; set aside. In large bowl, mix all coffee cake ingredients except blueberries and rhubarb; beat with spoon 30 seconds. Fold in blueberries and rhubarb. Spread in pan. Sprinkle with topping. Bake 45 to 50 minutes or until toothpick inserted in centre of cake (not fruit) comes out clean. Cool 10 minutes. Remove from pan if desired. In small bowl, mix all glaze ingredients until smooth and thin enough to drizzle. 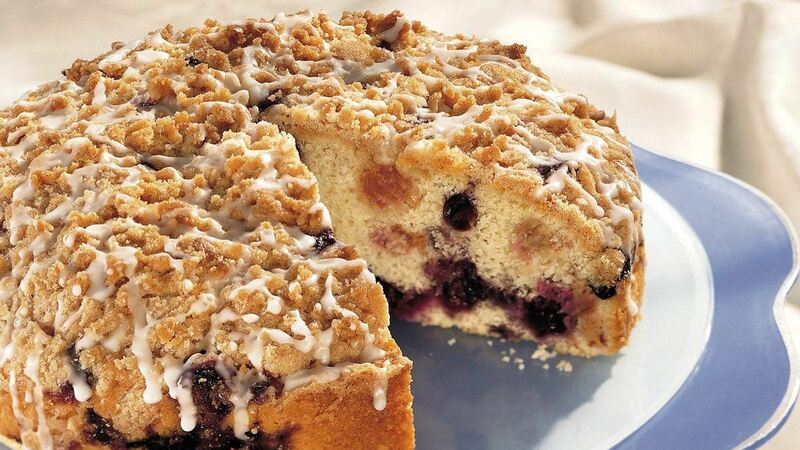 Drizzle glaze over warm coffee cake. Serve warm if desired. Tip: Sprinkle with your favourite chopped nuts for a special touch.